The Hortus Botanicus VU, located at the Amsterdam business district the Zuidas, will be host to a knowledge- and expertise center where artists, experts and audiences meet to learn about plants, biodiversity and ecosystems. The way we relate to nature must necessarily change. We have feared, exploited and consumed nature, now it's time to start working with nature again. In a public program, starting this spring, we want to rebuild relations with plants and biodiversity, emphasizing the gardens educational, cultural, social and scientific functions. The first project developed in this context will be by artist Silvan Laan. He proposes a conceptual repositioning of the Zuidas as alpine habitat. A stone-clad high-rise environment like the Zuidas seems to attract animals of (semi) alpine origin, such as the peregrine falcon. The flight patterns of this fastest bird in the world (up to 350 kilometers per hour) will by studied by GPS. Data from the tagged birds, combined with the latest technology in the field of Virtual Reality and Oculus Rift, offers the public the opportunity to experience the flights. 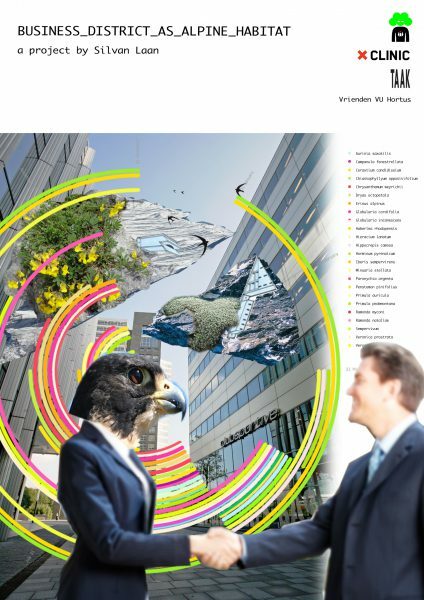 The Hortus Botanicus VU will be invited as curator of a small-scale customized botanical program to grow a diversity of plants on buildings and rooftops welcoming the peregrine falcon in it’s new habitat. The focus in growing the alpine habitat is on the element of time in natural processes: the time it takes for soil to build up, for pollinators to move in, or the seasonal rhythms of migratory birds. The internationally recognized environmental artist Natalie Jeremijenko's will visualize these cycles in a 'phenological clock'. Business District As Alpine Habitat is a co-creation by Silvan Laan, Natalie Jeremijenko (Environmental Health Clinic), Cure Master and TAAK, hosted by Hortus Botanicus VU.